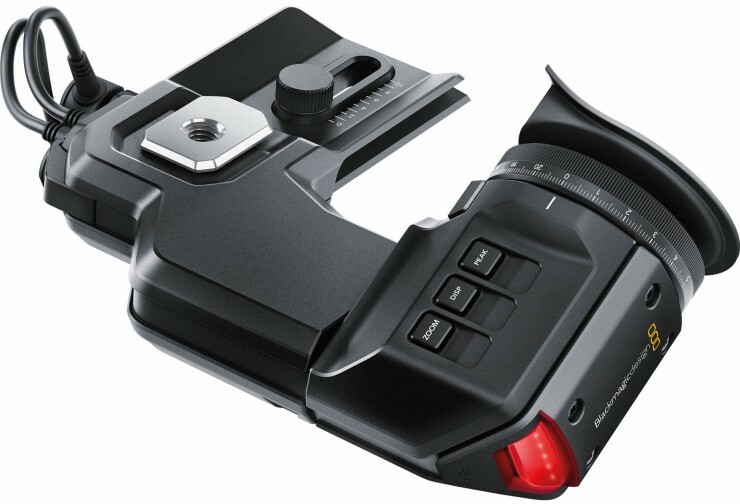 Among the many products Blackmagic Design announced at NAB 2015, we haven’t heard much about the Blackmagic URSA’s Viewfinder until now. The recently released 2.6 firmware update for the URSA bridges the two devices, providing support for the upcoming high resolution Viewfinder. The essential accessory for handheld shooting! – If you’re doing a lot of over the shoulder or tripod shooting outdoors, you’ll want to add a Blackmagic URSA Viewfinder! You get a high resolution 1920 x 1080 color display that lets you get incredibly accurate focus and the screen is so sharp that it’s impossible to see any individual pixels so it’s just like using an optical viewfinder on a traditional film camera. The viewfinder can be adjusted for either left or right eye use. Simply plug it into the power and SDI viewfinder output, then start shooting! The viewfinder even features a sensor that turns off the screen when you’re not using it to save power and extend the life of the OLED screen. In addition to making the URSA Viewfinder compatible with the Blackmagic URSA and URSA Mini, the 2.6 update also includes a new timecode display option and a variety of unspecified performance enhancements.